Mono mining packages have been employed in the Australian mining market for over 30 years. The pump is based on the rugged E-Range Flexishaft pump however it has been specifically modified to suit the arduous demands of underground mining. Available as a stand alone unit, a traveller or a main pump station with multiple pumps. 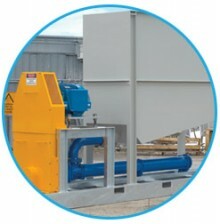 Options include inlet hoppers, discharge pipework and valves. Mono can design and supply de-watering packages with 1000V or 415V drives.